Have an iPhone? Don’t dump hundreds on an Apple Watch just yet. Use an Android phone? Hold off before you commit to that new Samsung Galaxy Watch. 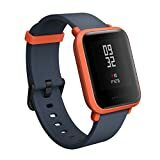 Amazon recently dropped the price of the $100 Amazfit Bip Smartwatch by Huami down to $79.99, and right now there’s an extra $5 coupon available on all four color options. This great smartwatch is compatible with both iPhones and Android phones, and it’s packed full of features like GPS, all-day heart rate monitoring, sleep tracking, and more. On top of all that, it lasts up to 30 days on a single charge! Note that the $5 coupon is only available when you choose “Amazfit US” as the seller on Amazon. Look as Good as You Feel: With a range of colors and options, the Bip is designed to be worn as an extension of your personal style. Weighing only 1.1oz (32g), and with a bright, transflective always-on 1.28″ display, the Bip can be worn all day.